A Ponzi scheme is a scheme that promising high rates of return with little risk to investors. The Ponzi scheme generates returns for older investors by acquiring new investors.. Madoff's investments went on for decades until people needed cash and liquidated. Why do I think index investing is a ponzi scheme? I've been a long term proponent of index fund investing, In fact all my accounts have index funds (or ETFs tracking indices) in them. An index fund is a type of mutual fund with a portfolio constructed to match or track the components of a market index, such as the Standard & Poor's 500 Index (S&P 500). One of the earliest index fund is the S&P 500 index fund. Nowadays, there are indices tracking almost all sectors, capitalization, international etc. You name it, there is probably a index fund for it. A complete list of vanguard index funds can be found here. S&P 500 index fund has out performed all actively managed funds over an extended duration of time. The Graph below shows how S&P 500 index has outperformed other equity funds over a 25 year period (1980-2005). Index funds are super cheap in terms of expense ratio (ER). The reason they are cheap is because there is not much of management (passive) involved in maintaining an index fund. It typically follows a buy and hold strategy. The concept of investing in index funds is based on the efficient market hypothesis. The efficient market hypothesis (EMH) is an investment theory that states it is impossible to "beat the market" because stock market efficiency causes existing share prices to always incorporate and reflect all relevant information. It might be possible to beat these index funds (S&P 500 specifically) over short duration of time (1-2 years). However, beating it over a longer time frame (5-10 years) is a different story. In 2008, Warren Buffett bet that the hedge fund industry could not beat a typical S&P index fund over a decade, and it's looking like he was right. On a personal level, I have been successful in beating S&P 500. Time frame is typically 6 months or lesser and involves picking 1 or 2 top performing stocks. I could not sustain this over extended duration of time. The risk was way too high and the rewards unpredictable. I am not entirely sure efficient market hypothesis holds true with the advent of financial Technologies or FinTech. Fintech is a portmanteau of financial technology that describes an emerging financial services sector in the 21st century. Companies like Betterment and Wealthfront offer investment products based on Modern portfolio Theory. Modern portfolio Theory is an investment theory based on the idea that risk-averse investors can construct portfolios to optimize or maximize expected return based on a given level of market risk. The problem is these new companies are democratizing and commoditizing investment. Previously to invest in an index fund it required $3,000 (if you have a Vanguard or Fidelity). It was possible to buy the corresponding ETFs with a $7 in commission and even then there was no possible way to buy fractional shares. With the Advent of these new Fintech companies it's now possible to buy fractional shares and investment can be as low as $10. I am not against everyone getting the benefits of stock market returns. I am all for it. Problem is that people who are investing with these new resources might lack financial knowledge or risk appetite. Again, they believe in the efficient market hypothesis and do not look into the valuation of the underlying stocks. Efficient market hypothesis is only true when we have a lot of active management going on. We depend on individual stock traders, hedge funds and other actively managed funds to continuously determine winners and losers. My fear is that with the huge increase in commodification of the stock market, we will see much more assets being invested in passively managed stock portfolios. If the passively managed assets go beyond (let's say) 50%, efficient market theory might no longer be true. At this point I believe the index funds would become a ponzi scheme. As long as people keep buying (new inflows) these index funds and ETFs the stock market will keep going up. Considering the current demographics it might very well be true, because we will always have a new crop of young people investing into these instruments. The change is succinctly shown in the picture below. There is a net outflow from actively managed funds. Vanguard offers an amazing list of actively managed funds with a very low expense ratio. The classic example is Vanguard Wellington fund which has been around since 1929 and it has gone through multiple stock market downturns (including Great Depression and Rescission). 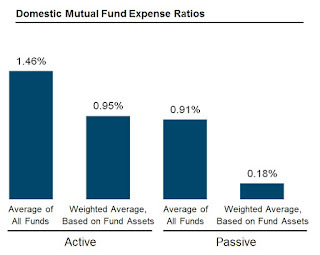 I personally think that passive investing through index funds are a great strategy. However, In a situation where capital invested in passive instruments is close (if not higher) to the capital invested in active instruments, does efficient market hypothesis still hold? I feel that it does not hold at the point and the stock investing turns into a ponzi scheme. Hopefully this scheme would be sustained due to exposure of index funds in 401k and FinTech companies. I do feel that in the long term things should even out. What are your thoughts? Do you agree with my assessment? Agreed. But as a index investor (mostly through 401s or ETFs) how do we secure our position? @dividendGeek - Very interesting topic. I also believe that index funds and the lower barrier to entry today provides a bit of an artificial floor for stock prices. Precisely. Question is do we continue to invest in index funds? Got to admit, interesting line of thought! How about the impact of the variety of index funds, not all have the same contribution and will affect the market at a broader level. That being said, think Tom has a point, at a certain time an equilibrium will develop. Guess it would only become a Ponzi scheme when there would be only a few very large once left that control the market. Love this post, DG. Almost nobody wants to question something innate like this. While I have been a proponent of indexing for a few years, theres a lot that I do not like about the industry. The setup is interesting, where liquidity flows into selected group of companies, which are picked by a few people who create the indexes. Moreover, they change index methodology constantly, and keep adding and removing companies -- which goes against the spirit of indexation. Passive investing is definitely a big bubble that needs to burst sooner or later, and its an interesting viewpoint to pose it as a question whether its a Ponzi scheme. I'm not too worried about indexing being TOO popular as I think the pendulum will swing the other way eventually especially once there's a recession and people want to move to funds that manage towards safety. I think there's an opportunity for funds that have some short exposure now that all these stocks are getting bid up because of their inclusion in index funds.